Abbreviations: M-int, NM - Near Mint, E- Excellent, VG- Very Good, G- Good , F-air, P-Poor, NS- Non-Stock, HBEG- Hollow Body Electric, FHAC- F-Hole Acoustic, FTAC- Flat-Top Acoustic, SBEG- Solid Body Electric, SSEG- Semi-Sold Electric, MIJ- Made In Japan, MOD - Modified significantly from stock, w/ O/C Original / Case, BIN (Auction ended at 'Buy It Now' price), UNK - Unknown manufacturer or model number, ACC - accessory. ALL RATINGS SUBJECTIVE. Silvertone World links in blue will open in a new window. 1300 Dano SSEG w/C G $415 Refinished/refretted neck , NS tuners, logo obviously missing, 'swoop' cutaway style , 5-side aluminum access panel , pot codes 137841 - 41st week of 58, a transitional guitar. 1429 Harmony HBEG w/ OC VG $510 NS tailpiece, original strap incl. 1482 Dano tube amp MOD $326 Seller says: "Case dissassembled to the core, reglued, and 1/2" Finnish Birch Ply Baffle Board, Tone Tubby 12" Hemp Cone speaker with efficient, articulate ceramic magnet, All worn caps, fuse, and resistors professionally replaced, New preamp tubes. Matched Soviet Military 6V6 power tubes (yowsa), Proper grounded 3-prong power cord and plug, Strong gig-quality back supports make case completely buzz-free, Original Silvertone Tremelo foot switch"
Funny how things happen sometimes here in Silvertone world, look at those two lap steels below. The auctions ended within four minutes of each other, the serial numbers and conditions of the pieces were a world apart, and the money for the nice one was better than double the other. A little more shine, a case, and a functioning volume knob was all it took to bring in the bucks. That particular lap steel is pretty interesting anyway, it's the Valco-made model 1311, advertised as "NEW" in the Spring/Summer 1958 Sears catalog, its model # changed to 1442 in Fall/Winter '59, and it was the sole lap steel available in the major catalogs until retirement in 1962. I'm working on pages for the steels (there weren't that many offered from '40-62), so look for that sometime this spring. Anything I'm not covering? Send me some suggestions, I'll do my best! 1448 Dano SSEG guitar only G $233 Edge wear , NS knob tops , signed by Darren McCartey of the Red Wings (hockey) and Grinder's lead guitar player, Billy Reedy. UNK Kay FHAC VG $357 'Triangle Top' Stamped N14. Another mystery. Seen one in a catalog? Email me. A mystery in Silvertone World... solved! Silvertonian MITCH has helped me solve the mystery, and actually solved TWO (we also have one, maybe two, still pending). He found the 1304, as we now know the brown model to be, in a 1958 Sears Wish Book paired with a matching brown 1389 amp that I'd never seen a listing for before either. Look for a full page with this new info soon! Apparently guitar and amp were 'holiday only' specials, as neither item have appeared in major seasonal catalogs. Time to start rooting through Wish Books to find the model number identity of the BLACK finished model now! I bet we're also going to find the 1451 amp offered somewhere along the way! Do you have a Sears Wish Book from 1957-through 1962? 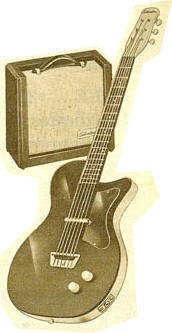 Send me a scan of the guitar and amp pages, and earn your Silvertone Merit Badge! UNK Dano SSEG VG w/C $415 I've got to figure out this mystery. 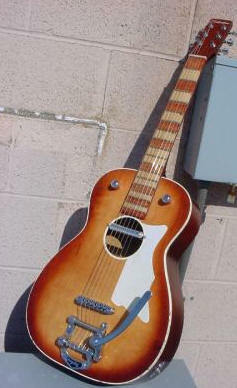 This guitar, as it appears, has never been listed in any major seasonal catalog. The finish is also unique: the majority are brown with gold sparkles, although I've seen a few stock black. The pickup is in a different position from any other Dano-built 'U' shape Silvertone guitar. The headstock is obviously the 'Coke bottle' style, but the inside pot codes and neck stamps of the examples I've seen place them right on the line of the Coke bottle/Dolphin nose headstock dateline (1959/60). The examples I've seen have had both the pre-Dolphin circular access panel on back as well as the 5-sided pressed aluminum. Any ideas? Was it a Sears 'store only' guitar? Did Danelectro have a bunch of 'Coke bottle' necks left and needed something to do with them? Was the pickup position trying to be the best of both worlds, inbetween lead and neck position? 1304 Dano SSEG G $315 Logo worn, dings on back, NS knobs, CTS pot codes date guitar to 1960. UNK $890 Here's a weird one: , the seller said it's just like a Silvertone his family used to own, the body is the body of a Kay-built 1361 (Silvertone 1361), but the 'blade' pickup , pickguard material , knobs and cavity cover material is the same used in the Kay K-161 (K-161 pickguard area), the so-called 'Jimmy Reed' model. No logo on headstock . Go figure.... certainly a unique guitar. I've never seen anything like it in a Sears catalog; the 1361 and 1363 (two-pickup) were only listed in the Spring of 1954, the first Danos displaced them in Fall/Winter 1954. Quite a week in Silvertone world, we've seen a lot of instruments pass through since last I wrote. Probably the nicest of the lot was that Kay-built 1372 hollow body electric, and the rarest was that (not strictly Silvertone) Supertone 'Crest' model. Interesting to see that 'skier' model ukulele from two different logo eras, and how about that Silvertone promo tape measure? I'd seen the lighter before, but never the tape. Also, one of the nicest 1484 amps I've seen going for a little over seven Benjamins, as well as a beautiful Dano 'Coke Bottle' 1300 Silvertone going for a 'Buy It Now' price of $875. In the amazing shape it was in, that was a bargain. Check out that UNKnown guitar down there... what is that? Fake? Re-model? Frankentone? UNK $172 Don't know what to make of this one... it's got a shape like a Harmony-made1326/7/1420/21, a similar model pickup, but the pickguard and knobs are clearly non-original, and the headstock logo just doesn't feel right... any ideas? Fake? Re-model? Frankentone? 1255 ukulele VG $40 Late 60s model, block logo, advertised as a 1952 for some reason, original box, poly pak with manual & felt picks incl. 1478 Harmony SBEG w/OC G $171 NS rhythm pickup , NS whammy/knobs/tuners, pickguard relocated 1/3"
That modded 603 has got to be one of the most insane, yet coolest mods I've ever seen on a Silvertone. Starting with a lowly Harmony-built 603, Joe Naylor of Reverend Guitars added a lipstick tube pickup and its attendant electronics, a well-adjusted Bigsby, a roller bridge and more to rev a simple plywood beater up into a hi-powered rockin' machine. - Bigsby B500 tremolo added. - Neck reset at correct angle. - Wilkinson EZ-Lock tuners added. - WD Lipstick pickup added. Height adjustable. - Neck sanded down to plain maple, radiused to 12", refretted with Dunlop 6105 frets. Large white side dots, and brown colored fretboard sections added. Fretboard clearcoated with satin urethane. - Volume (bass side knob) & tone (treble side knob) controls, and sidejack on metal football plate added. - Strung with 11-50 gauge electric strings. In like a lion; isn't that the phrase? It's been a busy March so far on the auction front, no real unusual items (except that super-nice super-rare (super ugly) Kay-made 1361 ) , just a lot of good, solid deals on our favorite guitars and amps. in his local dumpster. And it works! I know, I know... we should be so lucky. Well, maybe one of St. Patty's leprechauns visited him early this year. 1446 Harmony HBEG VG $788 Jack crack , surface scratches, pickguard missing, weirdness at bridge ... what is that? Some kinda mute? 604 Harmony FTAC w/C P $24 Sanded/peeled top, and it's been personalized with some scrawled lettering: "EADGBE and Jennifer loves Jason"
1446 Harmony HBEG w/OC VG $910 Seller bought in guitar1963 from music store, crack at plug-in , dings on neck and headstock, some edge flaking, some crazing of finish, "number inside of body 48061 and a E or a K and1446"
1361 Kay SBEG w/OC E $1279 Looks great, a few minor blemishes, deco headstock , 'cupcake' knobs , from 1954; part of the dawn of solidbody electric guitars. Looks a lot like a Harmony Stratotone, but experts tell me it's a Kay! Marching on in Silvertone World after a bang-up February; $86,107 changing hands for the 283 items I tracked on these pages during the shortest month of the year. The high dollar bringer was that as perfect as you're likely to find 1448 setup going for $1882, and the low ball item was a tunerless 1405/1410 neck going for $9. Here's what went: Twenty-four (!) 1448 guitar/amp/both setups, Fifteen 1484 amps, Ten 1457 amp/guitar/both setups, Eight 1481 amps, Thirteen 1482 amps, Five 1423 'Jupiter' guitars (or bodies thereof), Twelve 1483 amps, and a heapin' helpin' of other assorted Silvertone-branded guitars, amps, ukuleles, mandolins, speakers, parts and accessories. Sooooo... let's see if we can top that for March! We're off to a pretty good start, I'd say. Quite a varied bunch for the first few days of the month; don't see too many 1425 or 1245 guitars and we've got one of each, a very nice 1474 and a sad 1474 separated by only $180, a very nice 1448 setup going for relatively small bucks, and a quote from ebay user chucksguitarshop on the 'very nice' 1474 I mentioned: "That is the Holy Grail of 1474's. There were 4 different circuits (that I know of) listed & sold as the 1474. This is only the 3rd of this type (including mine) that I've seen in the last 10 years. Put a jumper in place of the reverb & WOW. Possibly the finest vintage Amp ever made. By the way, this amp puts out Roughly 20 watts RMS per speaker running Class A dual mono. The original P12Q's are only rated at 13 watts (although the reissues are rated higher). 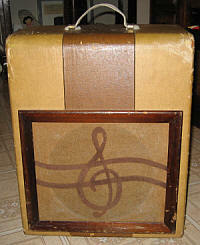 Stuff an old set of 25 watt Greenbacks in there & you'll NEVER find a better vintage amp." We don't see any 1432 amps for a while and then BOOM! Two within a few hours of each other. 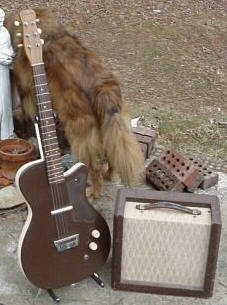 I've also gotta mention that UNK model Kay-built hollow body electric that went for no money (well, 81 bucks...). It's a rare 40s model, the only other one nearly like it I've seen is a 1323 model from the F/W 1946 catalog. These were the only Silvertones ever with that lightning bolt on the headstock and the knobs on the upper left bout.